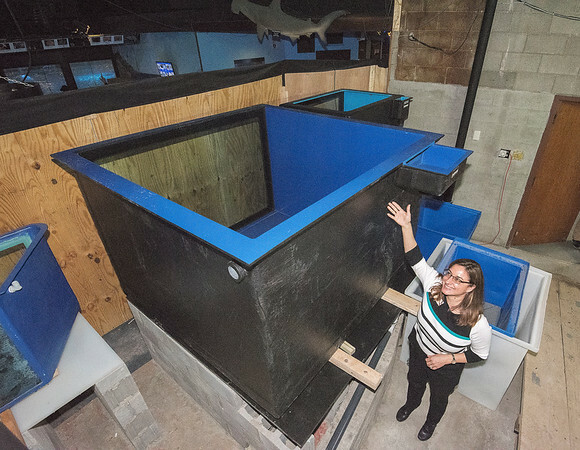 Niagara Falls, NY - Aquarium of Niagara Curator of Animal Care Richelle Swem shows off 2 new tanks that are part of the Oceans Alcove exhibits. One is a 900 gallon tank that will feature Indo-pacific Large reef fish that include Butterfly Fish, Angel Fish, Tangs and Triggerfish. The 300 gallon tank is for a Pipefish exhibit that will feature Banded pipefish, mandarin fish, shrimpfish, peppermint shrimp and Scarlet cleaner shrimp.